Vintage-Ware will be at the Vintage and Craft Summer Market at King Charles The Martyr Hall 10am to 4pm selling cakes, bunting and cushions. I will also have a selection of chinaware on display that is available to hire for celebrations, events and photographic staging. Traditional Afternoon Tea served on bone china crockery, join us from 2-5pm on 23 September 2017 in the unique setting of Main deck T S Brilliant, Albion Road, Tunbridge Wells. £15 pp, booking essential. October 15th 2016 afternoon tea at the home of Vintage-Ware, enjoy finger sandwiches, cakes and scones with friends or family in a comfortable setting, booking essential. email for further information and to register for future dates. 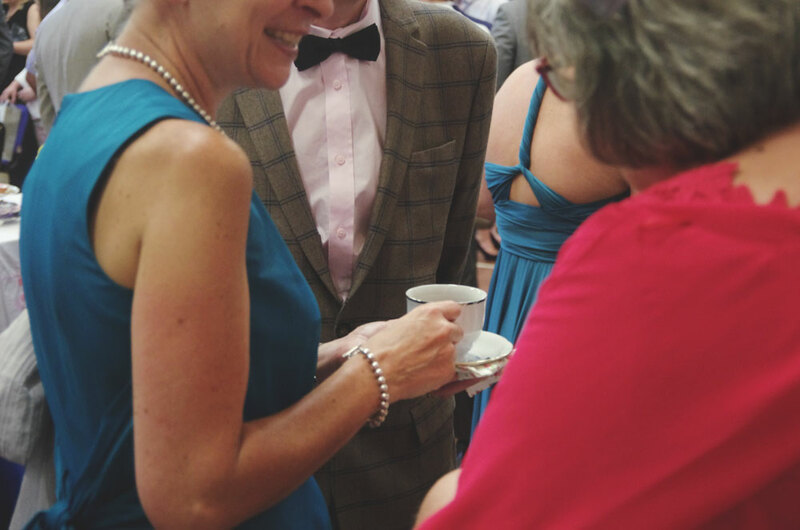 Vintage-Ware's first official pop-up tea event was held on 6th August at the wedding of Victoria Baker and John Oakley at St James Church, Tunbridge Wells. We transformed the hall with soft muslin, bunting, paper pom poms, fairy lights and wild flowers in decorated jars supplied by the bride all of which worked well with out vintage china.